How to keep the little ones happy on your special day. Children are a high priority when it comes to weddings. Hiring a childrens entertainer will take away a large amount of stress for you and it is one less thing to think about. It's your big day, make it a happy event for the little ones too and get your wedding remembered for all the right reasons. Wedding entertainment for children is becoming more popular and keeping the kids happy and entertained at your wedding is something that will help your wedding day run smoothly. Hiring a party organiser who is also a childrens entertainer is the best idea to go with. Derby based Midlands childrens Entertainer Stuart Brown will keep the children entertained for as long as you require. 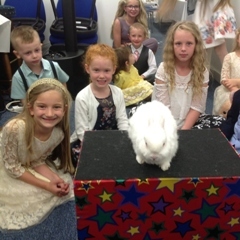 Childrens entertainment is important as for anyone who has children will know that trying to keep them amused for hours on end during a wedding or family party can be a daunting task. Wedding days can seem a very long time for young children with nothing to do to keep them occupied. When the big day is over, one of the sure signs of accomplishment is when all your guests tell you what a superb time they had. Obviously it's vital that you enjoy it yourselves, but it's also essential to bear in mind your guests and the range of ages when organising your activities and entertainment. Whilst humorous speeches, enchanting food and gorgeous table decorations are sure to make an impression and delight the mainstream of your guests, they will have modest impact on anyone of a young age. Unfortunately, for the children, the wedding reception can be tiresome. Children who aren't being kept entertained are likely to become restless and bother their parents. All of a sudden, neither the children nor their parents are having an enjoyable time and that's certainly not what you want. Kids and weddings don't always go together as usually there is nothing for them to do during the evening event whilst your guests have a good get together. You need something to keep the children occupied and stop them turning the flower display into a jungle or the dance floor into a skating rink. A childrens entertainer with a magic show, balloon modelling, music, bubble machine and games has something for children of all ages, and even the adults will enjoy it too. 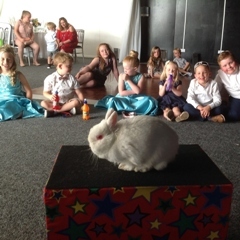 It is often the case that the adults will want to go and watch what is happening and there is plenty of scope for those extra photo opportunities with the children enjoying themselves, especially with the added bonus of music and a bubble machine plus the live rabbit called Snowy in the magic show. 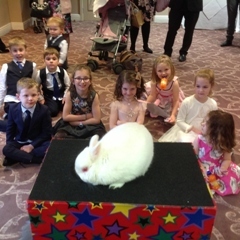 Sometimes weddings can be remembered for all the wrong reasons so why not hire a childrens entertainer so that your wedding can be remembered for all the right reasons and that you took care to make sure that the little ones were looked after too. An entertainer is an increasingly popular solution to the problem of how to keep both parents and children happy during your wedding day and to bring in some type of entertainment specifically for the younger guests is the ideal soloution. Although this can be seen as just one more expense to add to a list of expenses it can be a very worthwhile investment considering how much it can add to the happiness of the occasion and what a difference it will make when looking back on the day to know that everyone at your wedding was truly relaxed and happy to be there and not worrying about how loudly little Tommy had been screaming during the Best Man’s speech or how your best friend had to miss the speeches altogether to take her little one out into the corridor to run off some energy. With a fun and flexible approach to entertaining children at weddings there is something for all ages and any number. 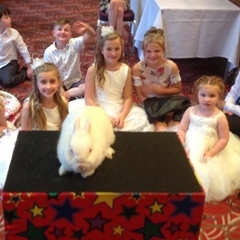 Our wedding entertainment for children takes the stress away from keeping the children occupied during important parts of your wedding such as the speeches or the evening entertainment. As a children's entertainer we cater for children of all ages and make sure that they are kept entertained for as long as you require. As you can see, children are a high priority when it comes to weddings. Hiring a childrens entertainer will take away a large amount of stress for you and it is one less thing to think about. It's your big day, make it a happy event for the little ones too and get your wedding remembered for all the right reasons. 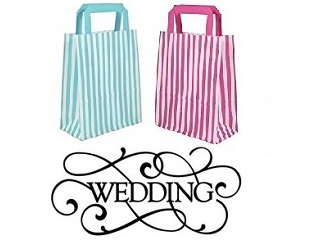 We can also supply wedding gift bags for the children if required and details of these can be found on the Party and Gift bags page. Here are some interesting results from an online poll held by a Wedding magazine recently. 75% of all brides say they wish they had spent more time choosing their reception entertainment. 95% say they would have spent more of their budget on the entertainment. During wedding planning, Brides say their highest priority is their attire, followed by the reception site and caterer. Reception entertainment is among the least of their priorities. Within a few days after their reception, 85% of Brides say they would have made the entertainment their highest priority. When asked, 90% of guests say the thing they remember most about a wedding is the entertainment. The second thing is the wedding dress design . 75% of all couples said they will definately be inviting children to the wedding. 90% of all couples said they would be inviting children to the wedding reception.